Well travelled techno troubadour Rocco Caine is the man next up on !Organism. He offers two firing originals whilst DJ Emerson steps up to remix. Caine is a real master of his tools and has been making searing techno and electro for years on labels like Drumcode, Leutral and Kamzleramt. As a DJ he plays across four decks and favours a precise and clean production style that makes him out in his own field. The two cuts here are both serious weapons. 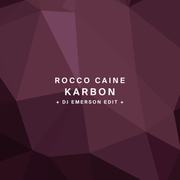 Excellent opener 'Karbon' is an exhilarating ten minute ride that has fierce kicks down low and frazzled synths squirming about in the mid ground. A rising, brooding sense of tension and jangling chords slowly build throughout, and when the whole thing drops whole clubs are sure to march as one to the stripped back brilliance. Remixing is micro.fon and kiddaz label boss DJ Emerson, a German with more than 15 years experience behind him. His take is a little more icy and reserved, spooky and haunting, with slithering hi hats and suspenseful chords hanging above rolling drums. It makes a big impact, to be sure.Last of all, 'Trias' comes on like a steam train and rattles along a rather desolate landscape with electrified synth sounds and real menace in the sweeping bass. This is techno that will fill dance floors with large scale sounds and is sure to blow plenty of minds. Once again !Organism prove they have real breadth and depth in their ranks with this latest compelling EP. Alexander Kowalski (Damage Music / Berlin) Excellent release. Always been a big fan of Roccos productions. And he delivers again. "Karbon" is the one for me. I also really like the DJ Emerson Remix. HOBI (!Organism / ARTS / Planet Rhythm) Great release. DJ Emerson remix for me! Coeter One (Kaputt Musik / Flash) Nice release. Will use the Emerson Remix. Dykkon (Vibe me / Berghain) Trias for me. Support on my radio show !! DJ Fronter (1605 / Orunmila) Perfect release. DJ Emerson Remix is my favorite. Porter Rhodes (Pornographic Recordings / Naked Lunch / Pragmatik Recordings) Great release. Trias and Dj Emerson remix are great!! 53 Hz (Toolroom / IAMT / WTF! Music) Great release. karbon for me, sounds amazing !! Sin Sin (!Organism / Driving Forces) Perfect release. The DJ Emerson remix is great. Karbon original is pretty cool too. Timmo (Drumcode) Perfect release. This DJ Emerson remix is pure bomb!! Trias is also amazing tune. Love the release!